Mrs. Moon was born in the village of Sinli in the Anju District, now called North Korea, on January 6, (lunar), 1943. Her mother, Mrs. Hong, was an earnest Christian and her father was a disciple of a famous preacher, Rev. Young Do Lee. The North Korean Communists persecuted their family and in 1948, when Mrs. Moon was 5 years old, she and her mother were arrested by Communist police and jailed for 11 days. After their release, Mrs. Moon, her mother and her grandmother fled their village in the middle of the night. They went to Taegu where they lived through the Korean War and where Dr. Moon was reared in a religious environment. The family later moved to Choon Chun, where Mrs. Moon's uncle was living, and she soon graduated from elementary school in that city. During this period, Mrs. 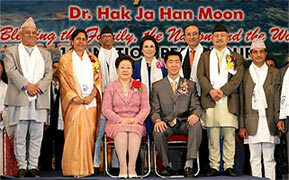 Moon, along with her mother, joined the newly formed Unification Church. Five years after joining, on April 11, 1960, the young Mrs.. Moon married the church's founder, the Reverend Sun Myung Moon. 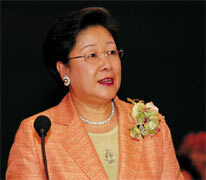 She stands as co-founder of the Unification Church, equal in stature to her husband. Mrs. Moon is a devoted wife, the mother of 14 children and the grandmother of 40 grandchildren. She is known for her extraordinary compassion, capability, grace and charm. Above all, she is exemplary as a woman who has a created a God-centered marriage and family of three generations. The heart and soul of Reverend and Mrs. Moon’s lifelong ministry is the re-establishment of God’s ideal of the family as the foundation for harmonious societies and the cornerstone of world peace. The Marriage Blessing movement, which began with the marriage of three couples in 1960, has reached millions of couples worldwide. Mrs. Moon and her husband presided over the marriage blessings in Washington, D.C.'s RFK stadium in 1997, in Madison Square Garden in 1998 and in Seoul's Olympic stadium and other venues in successive years ever since. In 1968, the Reverend Moon established the Professors World Peace Academy in Korea, and in 1972 the first International Conference on the Unity of the Sciences was held. These and similar organizations have attracted the participation of scholars, scientists and leaders in the fields of religion, the media, government and the arts, including numerous Nobel Laureates. Mrs. Moon played a crucial role in all of these developments, where her compassionate friendship completes her husband's challenging vision. Through addressing informal gatherings of women at these activities, Dr. Moon began to make her appearance in the public sphere. Her speeches included the Address to the Women of the World Media Conference (October 1981) and the Address to the Women of the International Conference on the Unity of the Sciences (November 1981). Dr. Moon moved forward on the world stage for the promotion of God-centered values in 1989 when the Soviet media interviewed her. Her interview appeared in the Religion and Society section of Za Rubezhom (June 12, 1989). 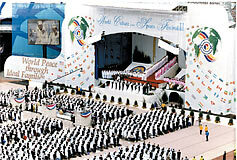 The Women's Federation was officially inaugurated on April 10, 1992, when, despite inclement weather, 150,000 women from 72 countries gathered at Seoul Olympic Stadium. Following this international rally, Dr. Moon spoke in cities and towns throughout Korea. That fall, speaking in Japanese, Mrs. 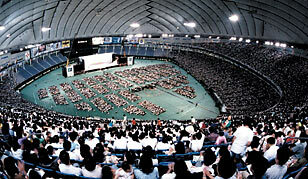 Moon addressed a rally of 50,000 women in the Tokyo Dome. 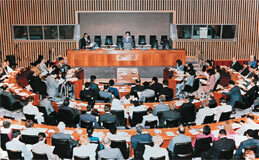 Subsequently, she delivered speeches to large audiences in Nagoya, Osaka, Hiroshima, Fukuoka, Sendai and Sapporo. Later that year, Mrs. Moon continued her worldwide campaign with an eight-city tour of America in eight consecutive days. Following her U. S. tour, Mrs. Moon spoke in eight more cities in Germany, Great Britain, France, and Italy and finally in Moscow. She also visited the Pacific Rim, where she spoke in Australia, New Zealand and the Philippines before addressing 200 leaders of the Women's Federation of China (no relationship to WFWP) at Beijing's Great Hall of the People. Leaders who praised the tour included Ms. Maureen Reagan, Mrs. Coretta Scott King, Dr. Cecil Murray and Reverend Jerry Falwell. A call for the declaration of National Parents Day was entered into the Congressional Record in both the US Senate and House, and the California State Senate issued a Certificate of Recognition. President Clinton signed into law a bill authorizing the last Sunday in July be recognized as, "National Parents Day". In dozens of states and cities, the day of her speech was declared the "National Parents Day", the "Day of Women and World Peace", or "Hak Ja Han Moon Day". Senator Orrin Hatch introduced her to the audience of US Senators, Congressmen, their aides and other dignitaries on Capitol Hill in the Dirksen Senate Office Building. The culmination of the American tour came when Mrs. Moon spoke to Ambassadors, counselors, attachés, and UN representatives and other prominent guests in Conference at the United Nations. His Excellency Stoyan Ganev, President of the United Nations General Assembly, introduced her. Ambassadors from 67 nations were in attendance with nearly 100 nations represented in total. Mrs. Moon and her husband founded the Universal Ballet Academy in Washington, D.C., which trains young dancers in the Russian style with masters from the Kirov Ballet of St. Petersburg. Dancers from the school recently won an unprecedented number of gold medals in international competition. The Universal Ballet Company, which they founded, is now a preeminent classical troupe. In 2005, Mrs. Moon accompanied her husband on an historic world tour to 100 international cities in 100 days. In the same year Mrs. Moon by herself, led 120-city world speaking tour accompanied by their children, their spouses and their adult grandchildren spouses who also served as speakers. During this tour, Mrs. Moon met with numerous heads of state including the President of India. Mrs. Moon is the recipient of many international honors and awards. For her humanitarian work and for her contribution to world peace, she has received honorary doctorates from institutions such as Bloomfield College in New Jersey and Argentina’s La Plata University and the Medal of Brazil from that country's Ministry of Education.